Because of the serious consequences of the annual flu, the CDC recommends the flu vaccine for all children aged 6 months. A recent study published in Pediatrics revealed that the flu virus can have significant repercussions for children. The authors described serious complications from the flu for children including deaths. And many of those deaths occurred in children without underlying medical risk factors. The study examined flu-related children’s deaths that had occurred over seven flu seasons, from 2004-05 through 11-12. The researchers gathered data on all of the deaths of the children, 18 years or younger, who had laboratory confirmed influenza infections during those years, a total of 835 children. During the 04-05 through 11-2 flu seasons, a total of 835 children died. The average age of the children who died was 7 years. Approximately 35% of these children died prior to admission to the hospital. Of the 835 children who had died, the researchers had complete medical histories on 794. About 43% of the children who died (and for which there was medical history available) did not have a pre-existing, high risk medical condition that increases the chances of complications for the flu. About 33% of the children who died had neurologic disorders. About 12% had genetic or chromosomal disorders. Children without a high-risk medical condition were about 2X as likely to die from the flu before being admitted to the hospital. Children without a high-risk medical were also 1.6 times more likely than children with high-risk medical conditions to die from the flu within three days of their first symptoms. Although influenza usually causes a self-limited illness, influenza can also be associated with severe outcomes in children, including death. Deaths can occur within a few days after illness onset. The potential for severe outcomes from influenza should be recognized in all children, both those with conditions that place them at higher risk of influenza-associated complications as well as healthy children. The findings of this national surveillance system report highlight the importance of influenza vaccination for all children >6 months of age and early empirical antiviral treatment of all children with suspected or confirmed influenza virus infection who are hospitalized; who have severe, complicated, or progressive illness; or who are at higher risk of influenza-associated complications due to younger age (<2 years) or medical conditions. 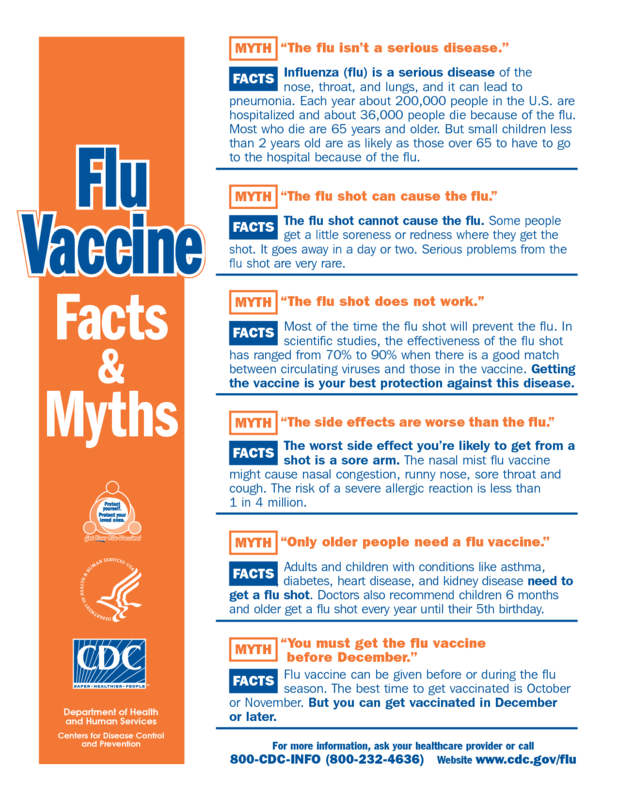 I’m sure you’ve heard the myth propagated by the antivaccine world: the flu is no big deal. Except when it is and when it kills children. Vaccinate against the flu–not because every child will have a bad complication to the disease, but because the vaccine can significantly reduce the risk of a child dying from the disease. Not all 835 children who were in this study would have been saved by the flu vaccine. However, since the effectiveness for the flu vaccine for children 6 months to 7 years is around 83%, nearly 700 of those children may have been saved by the flu vaccine. Children’s lives that could have been saved by vaccines. Bhat N, Wright JG, Broder KR, Murray EL, Greenberg ME, Glover MJ, Likos AM, Posey DL, Klimov A, Lindstrom SE, Balish A, Medina MJ, Wallis TR, Guarner J, Paddock CD, Shieh WJ, Zaki SR, Sejvar JJ, Shay DK, Harper SA, Cox NJ, Fukuda K, Uyeki TM; Influenza Special Investigations Team. Influenza-associated deaths among children in the United States, 2003-2004. N Engl J Med. 2005 Dec 15;353(24):2559-67. PubMed PMID: 16354892. Centers for Disease Control and Prevention (CDC). Estimates of deaths associated with seasonal influenza — United States, 1976-2007. MMWR Morb Mortal Wkly Rep. 2010 Aug 27;59(33):1057-62. PubMed PMID: 20798667. Fowlkes A, Dasgupta S, Chao E, Lemmings J, Goodin K, Harris M, Martin K, Feist M, Wu W, Boulton R, Temte J, Brammer L, Finelli L.Estimating influenza incidence and rates of influenza-like illness in the outpatient setting. Influenza Other Respi Viruses. 2013 Sep;7(5):694-700. doi: 10.1111/irv.12014. Epub 2012 Sep 18. PubMed PMID: 22984820. Osterholm MT, Kelley NS, Sommer A, Belongia EA. Efficacy and effectiveness of influenza vaccines: a systematic review and meta-analysis. Lancet Infect Dis. 2012 Jan;12(1):36-44. doi: 10.1016/S1473-3099(11)70295-X. Epub 2011 Oct 25. Review. Erratum in: Lancet Infect Dis. 2012 Sep;12(9):655. PubMed PMID: 22032844. Next PostNext Vitamin D supplements–improves bone health or a waste of money?